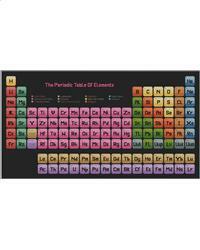 The Periodic Table of Elements - An Original Cross Stitch Design by CrossStitchCards. (Current version of the Periodic table shown as of April 2015) This is the largest of my designs to date, and one that I have wanted to do for a long time. This is designed to be stitched onto a dark fabric, so that the colour blocks appear to be popping off the fabric. The dark fabric will automatically form the framework around the table, so that no border lines need to be stitched. The finished design measures 358 stitches wide by 186 stitches long. There are 34 colours in this design, three shades in each colour grouping, plus black. All cross stitches to be done in two threads, and backstitch in one thread. Fabric sizes needed to include a 3” border all the way around: 14 count aida or 28 count evenweave: 32” x 20” 16 count aida or 32 count evenweave: 29” x 18” 18 count aida or 36 count evenweave: 26” x 17” I recommend using an evenweave material, as there are a lot of fractional stitches in this design, and they will be easier to stitch and look better on your finished piece.